You’re busy focusing on your business. 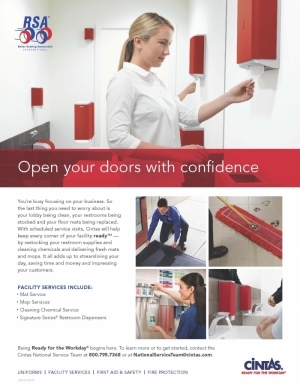 So the last thing you need to worry about is your lobby being clean, your restrooms being stocked and your floor mats being replaced.With scheduled service visits, Cintas will help keep every corner of your facility ready™ —by restocking your restroom supplies and cleaning chemicals and delivering fresh mats and mops. It all adds up to streamlining your day, saving time and money and impressing your customers.